3/18/2014Share this story on Facebook! According to Greg Glassman, the founder of CrossFit Inc., the workout offered by the CrossFit program aims to “prepare trainees for any physical contingency—prepare them not only for the unknown but for the unknowable.” CrossFit promotes the use of a continually changing array of aerobic and weight lifting exercises to improve muscular strength, cardiorespiratory endurance, and flexibility. Both Eamon Coyne ’12, M.S. 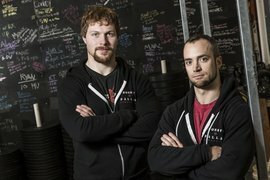 ’14, and Tim Paulson ’12, M.B.A. ’13, licensed owners of CrossFit Pallas in Ithaca, embody the CrossFit attitude in mind, body, and spirit. After graduating from high school in 1999, Coyne joined the U.S. Navy as a communications specialist, where he served in combat positions in Iraq and Afghanistan. He returned to the United States in 2008 and enrolled in Ithaca College’s School of Business to study business management. At the same time, Paulson was studying accounting at IC. The two met when they were playing on Ithaca’s club ice hockey team, and they often worked out together. Their hockey coach, accounting professor John McKinley, eventually became their faculty mentor when Coyne and Paulson began talking about starting their business. McKinley, who is also a lawyer, advised the pair on their lease for the gym and gave them tips on starting a business. “John has been of great assistance from the start, helping us write our operating agreement, looking over the tax forms I prepared, and providing general business wisdom whenever we needed assistance,” Paulson said. Management lecturer Heather Lane, M.B.A. ’10—the owner of Purity Ice Cream in Ithaca—also served as a mentor to Coyne and gave him the confidence he needed to take the leap into owning his own business. And management professor Linda Gasser’s Organizational Development class was vital in giving him the foundation for organizing the business, Coyne said. In 2012 Coyne, who had been doing CrossFit for over 10 years, proposed the idea of starting an affiliated gym in Ithaca to Paulson. He and Paulson split up the initial work, putting into practice the skills they developed while earning their undergraduate degrees. Paulson set up the pay structure, membership and revenue estimates, and depreciation schedules while Coyne wrote up the business plan—including equipment costs—contacted vendors, described Ithaca’s demographics, and proposed a marketing plan. Their business has thrived for the past two years in a modified warehouse on Court Street, but the time has come to expand. Coyne and Paulson have sent a proposal to the city planning board to develop a new space—10 times larger than the old building. The co-owners credit Ithaca College for preparing them and giving them the confidence to invest in such a large venture right out of school. “What lets me sleep at night is knowing that I have a very marketable skill set that has been strengthened through my formal Ithaca College education and my informal personal experience,” Coyne said. As for the future, both Coyne and Paulson plan to complete their graduate degrees at IC and continue to expand their business.